James Rodriguez has finally admitted there is a strong chance that he will leave Real Madrid next month, whilst also claiming that he has offers from a number of clubs. The Colombian playmaker signed for the La Liga giants for a sensational £63 million after shining at the 2014 World Cup, where grabbed six goals in five games to win the Golden Boot award, as Colombia reached the quarterfinals in Brazil. 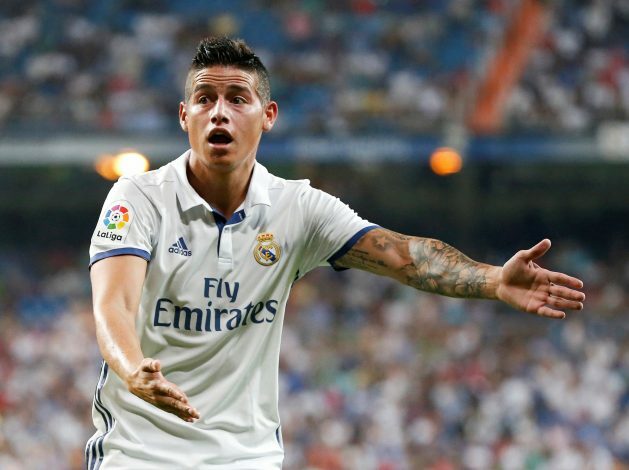 James then impressed in his debut season with Real as well, scoring 13 times in 29 La Liga appearances. However, his career took a turn for the worst under new manager Zinedine Zidane, with regular playing time becoming hard to come by. And Rodriguez, who was an unused substitute during Sunday’s 4-2 Club World Cup final victory against Kashima Antlers, has now refused to deny a possible transfer away from Madrid in the near future. “I can’t assure I will stay at Real Madrid. I have offers and seven days left to think about my future,” he told reporters, as quoted by Sky Sports. Paris Saint-Germain, Chelsea, Manchester United and several other big guns of European football have been linked with a move for the 25-year-old Real Madrid star in recent months. However, latest reports in British media claim Premier League leaders Chelsea are strong contenders to sign James, as Antonio Conte has reportedly identified James as a potential replacement for Oscar if the Brazilian leaves for China.